Kathmandu, Aug 25 (IANS) Former Nepali Prime Minister and CPN-UML Chairman K.P. Sharma Oli on Friday termed Prime Minister Sher Bahadur Deubas activities and the statements during his ongoing India visit as “disgraceful”. 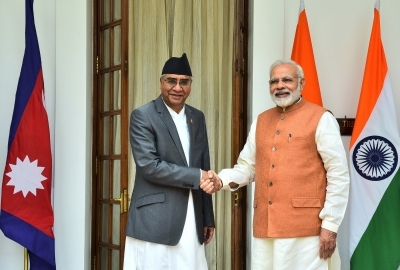 During a joint press conference on Thursday, Deuba told Indian Prime Minister Narendra Modi that efforts to amend the Constitution were underway. “He is the Prime Minister, he took the oath of office and secrecy from the same Constitution. He was elected the Prime Minister under the same Constitution,” he was quoted as saying by the Kathmandu Post. The Communist Party of Nepal (Unified Marxist-Leninist) Chairman said that Deuba, who is in India on a five-day visit, made a mockery of the decision taken by lawmakers of Nepal regarding the Constitution amendment. Earlier on Monday, the much-awaited Constitution amendment bill which was brought to address key demands of the agitating Madhes-centric parties failed to muster the required two-thirds majority in the Legislature-Parliament. Maoist leader Pushpa Kamal Dahal “Prachanda” — whose Communist Party of Nepal (Maoist Centre) is an ally in the coalition government headed by Deuba — also took exception to the remarks made by the Nepal Premier during his India visit.